Attach to phone receiver to pickup both sides of the conversation. Works on all traditional phones. May not work on cell phones unless phone has an induction loop. 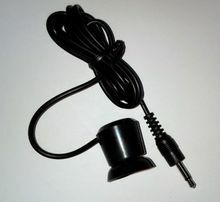 Standard plug fits most average size recorders, is 3.5mm. (1/8th inch) 3 foot cord. Attach the suction cup to the handset behind the earpiece, and plug the 3.5mm mono connector into any standard recording device. For handsets that have the dialing keypad in the handset you may experience interference in your recording. This item works best when you can place the suction cup on a handset that is separate from the rest of the phone. Worked exactly as described when other, more expensive item didn't. I would have no trouble doing business with them again. The suction cup sticks on either the opposite side of the physical hearing speaker earpiece on the handset or on the side or top of the earpiece on the handset. You can then use the handset as you normally do. Just like the ones you used to get at Radio Shack. The item works really well. The Seller was great to work with. I'd order from him/her again. Quick shipment, exactly what I was looking for, thank you so much! Very pleased with seller performance. No problems, works as expected.